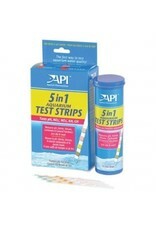 Aquaria AP 5 IN 1 AQUARIUM TEST STRIPS - Rick's Pet Stores Inc. In order for fish to thrive, water conditions in the aquarium need to be the same or very similar to those found in nature. This kit measures 5 of the most important aquariums conditions: pH, Nitrite, Nitrate, Carbonate and General Hardness. Improper levels can cause fish stress, which can lead to illness and death. This kit contains 25-test strip, easy to read instructions, and information to correct unsafe water conditions. For fresh and saltwater aquariums.